I seem to take quite a lot of photos of windows in various shapes and sizes. I also like pictures of bicycles. Here I have managed to combine both. Ah, and it isn't it great to be able to combine both! I always enjoy your captures and your humor, Rune! Hope you have a lovely weekend -- with lots of bikes and windows!! Both windows and bikes tell us stories and ask so much questions. That's maybe why you like them.. I hope that you're spending a good summer! thanks for the day brightener. nice how daisies oull the two together. Come to Cambridge if you want to see bikes...plenty of windows too. I like windows too and that's a good'un. I like windows , me too.Enjoy your w.e. Rune, regarding your comment on my post for the day -- the last shot was taken of a reflection through a "half" window on the deck of a restaurant overlooking Puget Sound. My son took me there for my birthday last year and it is a beautiful place. Enjoy your weekend! The bike looks lonely and forgotten with the weeds growing through the spokes. Great shot! Jeg kjøpte en gammel damesykkel på et bruktmarked, ganske nylig. Legger nok ut bilder av den. To fluer i en smekk, med andre ord :) Ja, du har blikket med deg og komponerer interessante bilder. Dette intet unntak! Now this one is different. 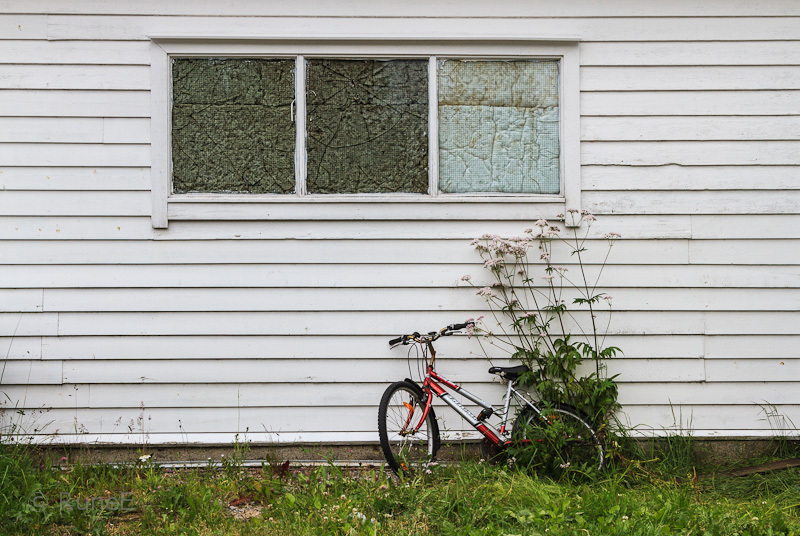 I do like the contrast of the stark windows covered on the inside by some gastly looking puffed paper, the weeds on the outside and lo, a beautiful red bike and some flowers to boot! Contrasts indeed. Rune, you are helping me to see beauty in scenes I would never have looked at twice. This photo is very interesting, I must say. we are cruising the Baltics soon and will be in Oslo Sunday 29th July. Is that mattresses pressed against the windows? Really weird and somehow not comforting, especially since they sit over a child's instrument. Windows associated with children should be open--onto sunshine. But this does make a good, provocative photo. What's up with windows? Covered with what? Styrofoam? And the weeds add much to the picture! Great photo! En fin og fredelig komposition, Rune. God sommer! I like this photo! I always enjoy your window shots but I like the flash of red in this photo especially. Beautiful composition. Very relaxed feel. The kind of image I can stare at for the longest time.